Looking for something to make your brunch table look really attractive? 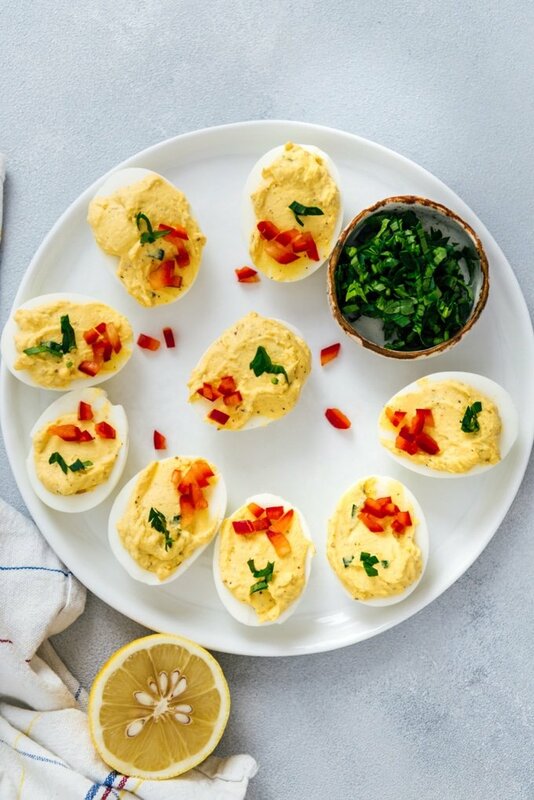 Make these Creamy Deviled Eggs Without Mayo and get ready for compliments! These easy deviled eggs are guiltless, creamy with Greek yogurt and slightly tangy with lemon and mustard. Perfectness for occasions! I know deviled eggs are mostly considered as Easter food, but it would be unfair to make these only for one occasion. Don’t you think they make super party food at any time? I’m sure everyone will be really happy to have them at potlucks. We love them at breakfast too. Not only in the morning. I mean they are great when we have breakfast for dinner during weeknights. 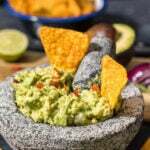 Super easy to prepare, super tasty and nutritious. Do you like having breakfast for dinner? We either make Turkish Eggs Cilbir or deviled eggs without mayo whenever we don’t feel like cooking a heavy meal during weeknights. The classic recipe for deviled eggs mostly call for mayonnaise, but I wanted to make a healthier version so that we could eat as many as we wanted. Deviled eggs with Greek yogurt make a great alternative to that classic recipe. First, cook the eggs. To do this, place the eggs in a sauce pan, pour cold water over them. Add in a pinch of salt and bring it to boil. Simmer for 5 minutes and remove from heat. Transfer them into a bowl with cold water and peel. Second, halve the eggs and remove the yolks. Put them in a bowl. Just because I love yolks, I add an extra yolk in the bowl. But this is completely my personal taste. Third, prepare the filling. Sprinkle salt, cumin and black pepper over the yolks. Add in olive oil, mustard, Greek yogurt, parsley and lemon or lime juice. Mix well with a fork. Fourth, share the filling into egg whites using a teaspoon. Finally, garnish each with diced red bell pepper and chopped parsley. To add a little more flavor to these deviled eggs, I add a little lemon juice and mustard. They give a good tanginess to the eggs. As for the spices, I just use cumin and black pepper in the filling. I don’t want my deviled eggs too spicy because I love to feel that creaminess rather than spices. I saw deviled egg recipes that use chopped onion in the filling, but I don’t want to deform the creaminess. I sometimes serve onions along with the eggs. Also, if you love some heat, it’s a good idea to use some green chili peppers for garnish. Some fresh arugula or other herbs on the side complete the serving wonderfully. I’m sorry this recipe is not for you if you are looking for deviled eggs with mayo, but believe me these are equally tasty and you can never know whether you love them unless you try. And believe me you will never want to use mayonnaise again once you taste these deviled eggs without mayo or sour cream. Deviled Eggs without mayo. Creamy with Greek yogurt, slightly tangy with lemon and mustard. Place eggs in a medium size pan, cover with water. Bring to boil. Simmer for 5 minutes and remove from heat. Rinse with cold water. Peel eggs and halve each lengthwise. Scoop the yolks in a medium size mixing bowl. Be careful not to damage the egg whites at this step. Add in olive oil, salt, cumin, black pepper, lemon juice, mustard and Greek yogurt. Mix with a fork until creamy. Scoop back into the egg whites. Garnish with red bell pepper and parsley. Lovely eggs, I make them without mayonnaise often as well. And you are right, they are not only for Easter, in Germany they are a very popular fingerfood, you will find them at most celebrations as part of the buffet. I bet these are so creamy and good! Love the idea of making deviled eggs with greek yogurt. I want to try these soon! Hi Erika! Greek yogurt makes it super creamy and yummy. Hope you have a chance to try it. It looks cool and delicous. I will try it soon. Thank for share ! Awesome, they look so yummy, I can’t wait to make this for my kids, they will love it. Thank you so much ! I made this for breakfast but sprinkled finely chopped chives and a pinch of garlic powder on top for a kick. Really good, thanks for sharing.